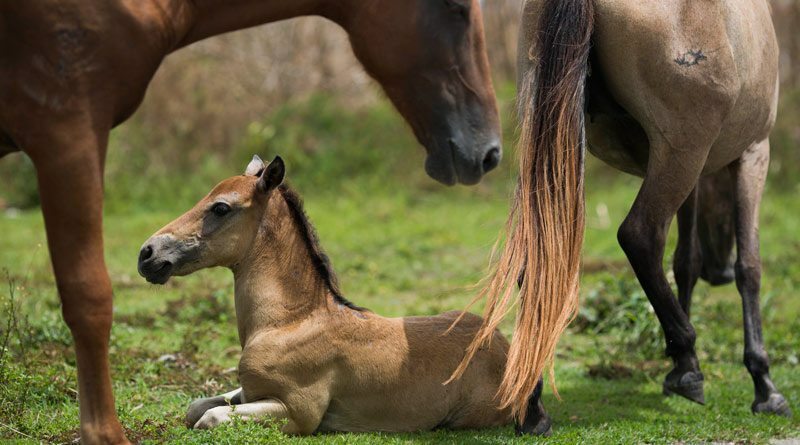 Several of the horses at the focus of a contraception management program on the island of Vieques in Puerto Rico have lost their lives following the devastation of Hurricane Maria. Some 280 mares from the island’s 2000 horses had been injected with PZP late last year in an effort to stem growing numbers of the horses on the small island. The island is known for one of the world’s most remarkable bioluminescent bays, and for its beautiful, free-roaming paso fino horses. But water is scarce on the island and in recent years drought has claimed several lives. The HSUS team bringing aid to the island had confirmed that some horses lost their lives, killed by storm surges or injury from debris, and a fair number of animals required medical attention. But they also said that the vast majority of the horses appear to have survived the storm. “We are providing them with supplemental food because the trees have been stripped bare and forage and fresh water are scarce, and we’ll provide as much medical care as possible,” said HSUS CEO Wayne Pacelle. He said Dr Dickie Vest, an equine veterinarian from the Cleveland Amory Black Beauty Ranch, wass helping to lead the response, with wildlife handling and response experts Dave Pauli and John Peaveler. “With the help of local citizens, our team is also caring for dozens of dogs, cats, and other animals at a mobile clinic they established to provide ongoing medical assistance for owned animals that people are desperate to get care for,” Pacelle said. Pacelle said the HSUS had brought in more than 25,000 pounds of animal and humanitarian relief, including food, water “and even diapers”. The South Florida Wildlife Center has been set up as an intake and distribution center. Nearly 350 shelter animals have been flown by Wings of Rescue to St. Hubert’s Animal Welfare Center in New Jersey, an HSUS Emergency Placement Partners. The HSUS team has transformed the town plaza in Vieques into a free, pop-up animal clinic, to provide ongoing medical assistance. It was also working to help animals on the streets who are in distress, and to provide food and emergency care to them. Many of these Sato dogs, as they are known, are community animals, and with circumstances so disrupted and dire, their human support network is in tatters. During this time, The Humane Society International team has also continued its work in areas of Mexico hit by two earthquakes. The team has so far provided medical services to more than 3500 injured animals, including cats and dogs, with 669 animals helped in Mexico City and the state of Puebla over last weekend alone.